For me personally the two days leading into any race requires planning in order to ensure I limit any stresses and can completely relax and focus on the big day. I have a plan for sleeping, eating, race kit & preparation so that the last days before the race I can completely relax. As mentioned in the previous blogs my menu for the days leading up to the event is completely planned. Wherever I have travelled in the world to race, I know exactly what to eat, how to hydrate and remove all the pressures associated with last minute race planning because its already been done. If you fail to prepare then you can prepare to fail. No need to cram everything into the last minute and make mistakes. The 48hrs prior to your race try to give us much focus to sleep, hydration and nutrition as possible. Keep the feet up nicely and allow them the much needed rest before tackling the gruelling event. If you do go to expo in the 48hrs before the event then please try not to spend too much time there. I stand at expo’s a lot and watching runners shopping for hours on end is just madness so close to a race. Limit your time on the legs or you will definitely land up fatiguing them. Expos are also famous for unhealthy fast food and beer drinking. Don’t get caught up in this. The amount of food passing through the kitchens each hour and the conditions in which they are managed is less than stellar before a major event. Take with water to the expo so when you are queueing you are hydrating as you never know how long you might land up being in the line for an potentially being exposed to the sun. As for the beer, its dehydrating you for sure and being in a dehydrated state before an event is not the place you want to be. Take with some snacks as well so that you can keep your stores nicely topped up at race registration. Eating or drinking something that doesn’t sit well with the body can cause digestive issues, illness and dehydration and it can lead to a really bad day out. For example if you are lactose intolerant do not compromise and consume any dairy steer clear of it. In many athletes red meat sits heavily in the stomach, so if this is the case with you avoid heavy proteins and rather eat lean proteins or plant based proteins. Finally do not try any new foods before the event stick to what you know and what agrees with you. Do not overdo it with stimulants especially caffeinated drinks such as coffee as they do have a diuretic effect and can also lead to sleep disturbance. You need to get a few good night’s sleep before the race, so you don’t want to impact your sleep by taking any stimulants which would impact it at night. Some athletes deplete carbohydrate stores closer to a race and then slowly build up that carbohydrate intake to maximize their glycogen stores. Don’t try this if you’ve never tried it before. There is no reason to overeat carbohydrates in those hours before an event because your glycogen stores will be topped up with reduced volume in training and it’s not going to make a major difference on race day. Overdoing it will just lead to weight gain and discomfort. Nerves are beginning the months of preparation are now coming to the big test. Friday night is the night you want to get a really good nights sleep and if you can extend it the following morning that’s absolutely fine. You wont be sleeping much the night before so get in as much sleep as you can the day before. Plan to eat nice consistent meals the day prior to the event. You can up the carbohydrate intake slightly but keep the eating controlled and manageable do not overeat. Hydrate consistently and try to avoid consuming anything that has a diuretic effect. Many athletes tend to eat a large meal the night before the race in order to really top up glycogen stores. I feel this is not necessary at all and can in actual fact be more damaging. Consuming a large meal the night before race day will set off some digestive discomfort and will impact your ability to sleep properly. Sleep is more important than overloading the digestive system. As for hydration do not drink a lot before sleep that night. Hydration should be done through the day. Drinking too much before you go to bed is just going to impact your sleep even more by forcing you to run up and down to the bathroom. If you want a slightly larger carbohydrate meal before the event then do it at lunch time, but keep the night time meal nice and small. I also would not advocate eating out the night before. I have seen many athletes eat hotel room service or take outs only to succumb to the ills of a bad stomach or nausea the next day. Plan your meal properly. In looking for the most appropriate pre-race meal the food firstly needs to be something that you are used to and have eaten previously. Do not try anything new on race day. Generally, I advocate a slightly higher carbohydrate meal, unless you are a high fat low carb eater (banter). Depending on the kind of diet that you follow you need to try and keep it simple and healthy. The best time to eat would be at least a minimum of two hours before the event start so that you have enough time to allow the food to digest and the stomach to settle. However many get up very early to drive far to the start and in this case I would look at an additional 100 Calories for every additional hour you eating before the event. If you eat breakfast early and its a smaller manageable meal then you can always take an easily digestible food on route with you to the start such as a banana and eat a little more before the event. You cannot just rely on the nutrition that’s on the course if you haven’t tried and tested it. The best way to fuel in an endurance event, specifically a Comrades Marathon is to make sure you separate your hydration and your energy requirements. Think about hydration in terms of what’s going to keep the body hydrated not about energy. Hydration has been spoken about extensively in the past and if you are not sure you can read my blog Simply Hydrate to get a more in-depth understanding. Most athletes will consume their energy in the form of carbohydrates and you should have by now practised the volume intake of carbohydrates you require per an hour to keep you sustained through the event. Runners have a more sensitive digestive system due to it being a higher impact sport than cycling so I do advocate smaller feeds, more frequently, as opposed to bigger feeds spaced further apart. The reason for this is twofold firstly the digestive system can cope better with smaller amounts of food at a time and more easily utilise and absorb it as opposed to dealing with a very large amount of fuel at once. Secondly it provides more energy balance. I call this the ‘drip feeding’ method, and I find it works very well for most athletes. Remember Comrades Marathon is primarily a fat tank fuelled event, its pace controlled so more oxygen to the system will allow for a better ability to burn fat for fuel. If you over consume carbohydrates you will give too much rise to insulin levels, mitigating fat burn and landing up on a roller coast ride eventually leading to potential nausea and even cramping if there is a glucose overload. Fuelling every 20-30 minutes as opposed to every 45 minutes to an hour would be a lot easier on the digestive system and it would allow you to balance that energy system out a lot better. In other words, clock feeding and making sure you do take something every 20-30 minutes. This will ensure better insulin response as well as less gastrointestinal distress and more manageable absorption in the digestive tracts. Caffeine during the race can play a benefit as well. Caffeine does metabolize fully over a period of around 60minutes, so my advice is to have measured doses throughout the event once you do start consuming. I recommend at least once an hour some athletes consume every 30 minutes, but this is something that needs to be tried and tested in training to see what the optimal dose is for you during exercise. Caffeine has shown to improve performance especially in the form of mental focus and in a long endurance event the mind needs to be focussed and strong. An absolute must for Comrades Marathon is protein consumption on route. If you’re going into an ultra-distance event and it’s going to be a lot longer than 4-5 hours, you should incorporate protein consumption on route, just to help act as a buffer and assist in delaying the onset of muscle fatigue. It also helps satiate you, in other words, it gets rid of the hunger pains and it does break up that intake of glucose. I would highly recommend a 1:3 protein to carbohydrate ratio which has been shown to maximize the delayed onset of muscle fatigue. If you want to know more I have recently done a video on a protein we fuel our gold medallists and elite athletes on route and it works extremely well. Click here for information on which protein to consume. Please make sure that you are prepared from a race nutrition perspective. If you’re not prepared, you better start thinking about it very soon and make sure you’ve got some sort of plan for the big day. On the day, stick to your plan, don’t deviate and you will get to the finish line feeling a lot happier and a lot more comfortable. DO NOT try anything different or new on race day. I wish you all the best of luck, may you have a great race. Mark Wolff is a certified sports nutritionist and an endurance nutrition and physiology expert with over 20 years experience. An endurance multi-sport athlete with a triathlon, mountain biking and weight lifting background, he works extensively with professional and amateur athletes in a variety of sports disciplines as well as those just wanting to change their lifestyles. He firmly believes that a person can only reach their full potential when their health and nutrition is down packed. 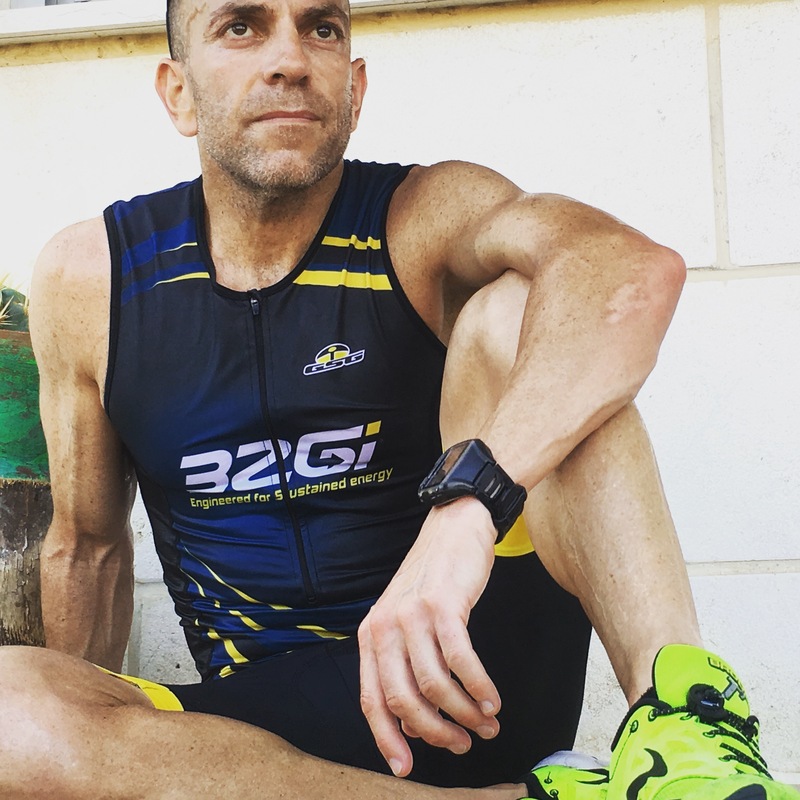 Mark’s focus on nutrition and physiology is not just on training and racing, but he places major emphasis on recovery, immune system health, emotional stability, stress management and performance. Mark is co-founder of 32Gi, a sports nutrition company, focused mainly on health and endurance nutrition.